This version of the Chinese Lanterns quilt block pattern finishes at 12" x 12". We'll use a combination of quick piecing and strip piecing to assemble the quilt block. The design is traditionally sewn in oriental fabrics but it's suitable for any theme you would like to create. My example uses a paisley print. Try Asian themed fabrics for the large lantern pieces, and black or tone-on-tone fabrics for the narrow accent patches. Make your lanterns from child-friendly or novelty fabrics. Small to medium scale prints would work perfectly if you would like to create a whimsical lanterns quilt. Take a look at the last two pages of the pattern for a few examples of lanterns that could be made with other types of fabrics. Take a look at Kate's Oriental Lanterns to see a lantern quilt block pattern with an entirely different appearance. Practice rotary cutting strips of fabric if you are a beginning quilter. Sew a 3-1/2" x 4-1/2" background piece to the 6-1/2" x 4-1/2" black fabric along the 4-1/2" sides. Repeat on the opposite side of the black strip. Press seam allowances towards the black strip. Square up one end of the strip (on its long edge) and cut two 2" segments. Draw a diagonal line from one corner to the opposite corner on the reverse side of each 3-1/2" x 3-1/2" square. Use the easy quick piecing method that's used for Snowball quilt block assembly to sew 3-1/2" x 3-1/2" squares to each end of both 3-1/2" x 12-1/2" lantern bars. Orient squares so that triangles are as shown above when they are flipped right side up. Remember to sew directly on the line as shown in the instructions (not offset as we sew half square triangle units). Sew a 1" x 12-1/2" accent bar lengthwise to one side of a 2-1/2" x 12-1/2" lantern bar. Sew an accent bar to the opposite side of the lantern bar. Press seam allowances towards the lantern bars. Arrange ​the components as shown above, lower left. Sew the rows together, carefully matching edges. Press seam allowances towards the background/bar strips. The quilt block should measure 12-1/2" square. If the quilt block is smaller, or skewed, press again and recheck. If it still isn't quite right, use one of my easy squaring-up methods before sewing it to other blocks. 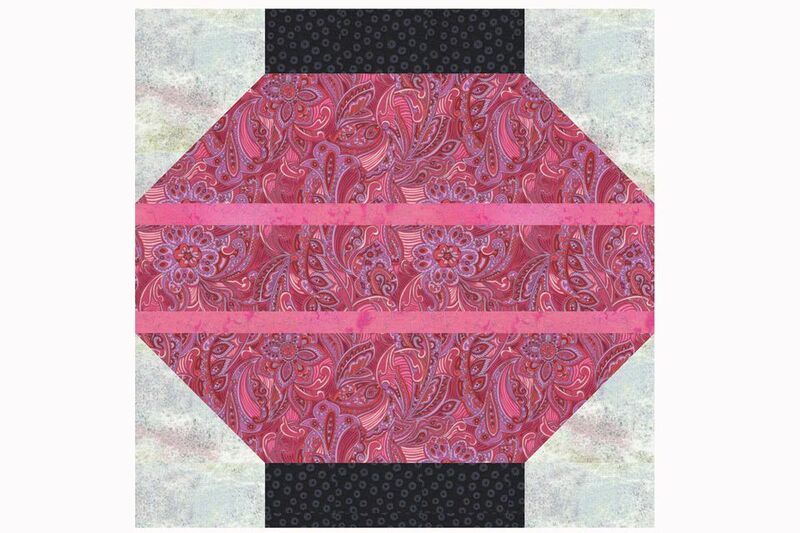 Arrange your Chinese Lantern quilt blocks in any type of layout you desire. They can be sewn together side by side or in vertical or horizontal rows with sashing between rows. You could also add sashing between all blocks (not shown). Use the lanterns pattern to make a colorful Halloween quilt. This brightly colored butterfly print is a good match for the lantern quilt block pattern.